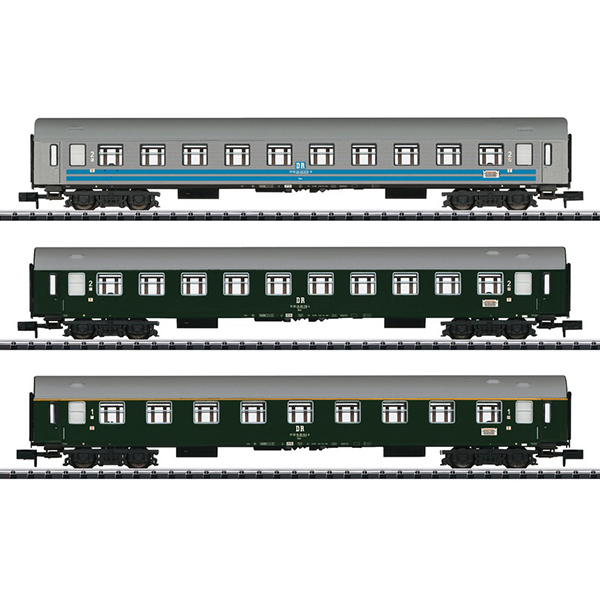 Prototype: Two (2) German State Railroad (DR/GDR) type UIC Y express train passenger cars, 2nd class, and one (1) type UIC Y express train passenger car, 1st class. Use: High-quality long-distance service, here in the Baltic-Orient Express at the beginning of the Eighties. Model: All of the cars have close coupler mechanisms. Interior lighting can be installed in the cars. Total length over the buffers 459 mm / 18-1/16".